Left: Construction of Kennedy Expressway, looking southeast from Chicago Avenue in Chicago, Illinois, May 1, 1960. Top right: Interior of Saint Stanislaus Kostka church during mass at Evergreen and Noble Streets in Chicago, Illinois, April 11, 1942. Bottom right: Looking east at the interchange of the Dwight D. Eisenhower Expressway, the John F. Kennedy Expressway, and the Dan Ryan Expressway, at Halsted Street, Chicago, Illinois, October 16, 1961. Also known as the Circle Interchange. CHICAGO — Seventy years ago, the idea of a major expressway linking the Northwest Side to Downtown began to take shape. The 17.8-mile Kennedy Expy. 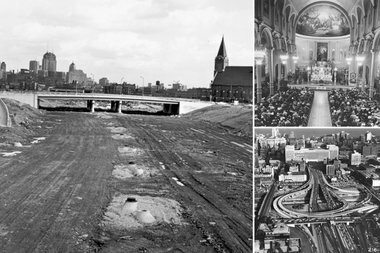 (originally Northwest) officially opened in 1960, 14 years after $170 million in funding from the state, county and city was acquired — according to WBEZ — and a few years after its route was changed to save an iconic Chicago church. Anyone who travels on the Kennedy will notice it wildly bends around Saint Stanislaus Kostka Church, 1351 W. Evergreen Ave., avoiding the church by just a few feet to the east. The church was founded in 1867 and is "still considered the mother church of Polonia in the United States," according to Peter Alter, Historian and Director for the Chicago History Museum's Studs Terkel Center for Oral History. "It's historically significant to the Polish community," Alter said. "People who are driving might not have an idea of what that church is, but they might imagine that the curve is there for a reason." According to an April 4, 1954 Tribune article, plans originally called for the expressway to be built to the west of the church, but that would have uprooted 400 families and left the church isolated. Other plans had the expressway going through the church, which would force the building to be demolished, according to WBEZ. But the church and the parishioners' homes were saved by State Rep. Bernard Prusinski, a civil engineer who hatched a plan to move the adjacent North Western railroad tracks to the east so the expressway also could be moved east of the church, according to the Tribune. The Tribune article noted Prusinski's idea also saved between $6 million and $8 million. "It saved a little money, an important parish and a fairly powerful political block of voters," Alter said. "The curve is very much in keeping with Chicago's history — in terms of immigration and politics. There were reasons to stretch that expressway around the church." According to his 1987 Tribune obituary, Prusinski was credited with saving the church, although some called the expressway's dramatic avoidance of the church the "Rostenkowski curve." That's in honor of the late U.S. Rep. Dan Rostenkowski, the son of one of Prusinski's political opponents, Joseph Rostenkowski. Dan Rostenkowski told the Tribune in 1992 that he wasn't responsible for saving the church, but, nonetheless, the church on its website gives credit to him, and not Prusinski, for its survival. The church now holds Masses in English, Polish and Spanish. "I've been in the church, and you can't really hear the traffic outside," Alter said.